Check out the step-by-step tutorial below! 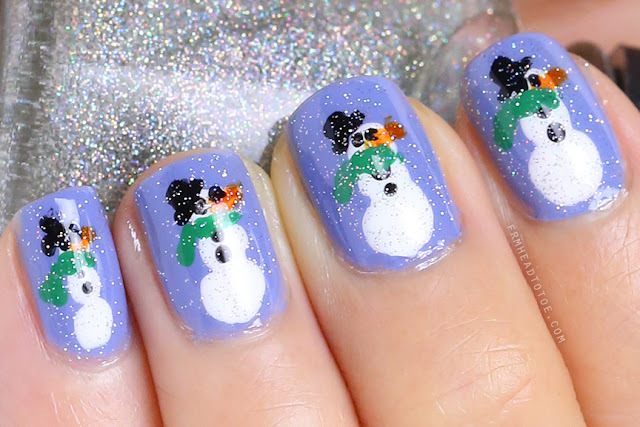 Originally I tried out this look on bare nails but I am such a fan of this China Glaze periwinkle blue which really brought out the shape of the snowmen. If you don't have these exact shades, no worries because it also looks great with loads of different background and scarf colors. One of my favorite parts of this look is the holographic glitter snow made by China Glaze's Fairy Dust which is has gorgeous rainbow-reflecting microglitter in a clear base. You can't see too much of the rainbow effect in my photo here but in real life, the color really dances across the nail and gives more "life" to the snowmen. If you don't have orange for the nose try a yellow, pink, or even red. The scarf and background can literally be any shade too! I hope you enjoyed this festive winter nail art and it brings a little happy into your life. Some lovely girls already tweeted me their versions (here, here, here) using different colors and I am SO impressed. To see something that gives me joy spreading to others is the best Christmas gift! If you try this out I'd love to see your version so feel free to post it on my Facebook page or send me a message on Twitter @frmheadtotoe and leave me a comment here on the blog as well! I love you guys so much and I hope that you are having an amazing holiday! Merry Christmas! sooo cute! Merry xmas Jen!! 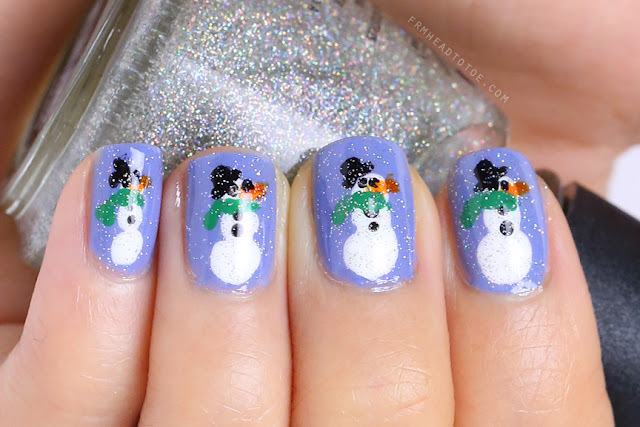 love the nails...they are so festive and adorable! Hope you have an amazing time with your family and friends! Happy Holidays! 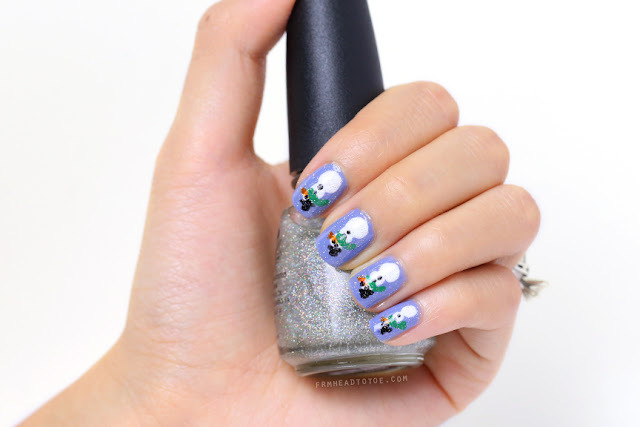 How cute is this mani!? Love it! Too bad I don't have enough patience to do this..
Love the nail tutorial! I should get myself one of those nail dotting tool! I also came across your heart-to-heart video about body image, and I think you're very inspirational and I hope you keep on sharing inspirational videos because it really does make someone feel comfortable in their own skin. With that said, I want to greet you a belated Merry Christmas, and a Happy New Year,I'm wishing that 2013 would be a great year for you and you get more blessings, and for you to be a blessing to others, as well. Thanks for answering on my tweet ;) It made my day! How are you and what did you find under the christmas tree? ;) Could you make a make up for New Year's party? Last year I recreated one of yours and was soooooo gorgeous! And maybe some video about year 2012 - summary with some new resolutions for 2013? Super cute design! I've only recently started doing my nails, but been having so much fun with coming up with ideas and trying new stuff out. Wow, these are so cute! You must have a really steady hand! love this look! question, how did you do this on your right hand (or whichever hand is dominant)? i imagine that must be a bit difficult..
Naughty & Nice List 2012!